So a complete pleasure to take part in this podcast with Rachel Holmes. 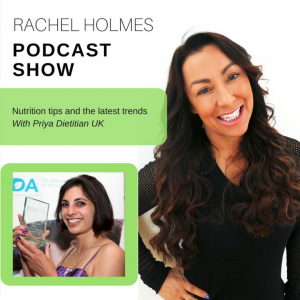 Take a listen for super nutrition tips, it’s an action packed podcast, no chitter-chatter but just full on content and at just over 30 minutes it’s a great length too. Totally love to hear your thoughts! Is there a best diet to be on? Feeding your kids – what to do and what not to do. Tips to take away and use today. Should we be going gluten/dairy free? My struggle with feeding my kids. Rachel is a fitness entrepreneur, a presenter and a trainer. She is inspiration in her energy levels and all she achieves. I’ve followed her and been to her course as a fitness instructor for many years.